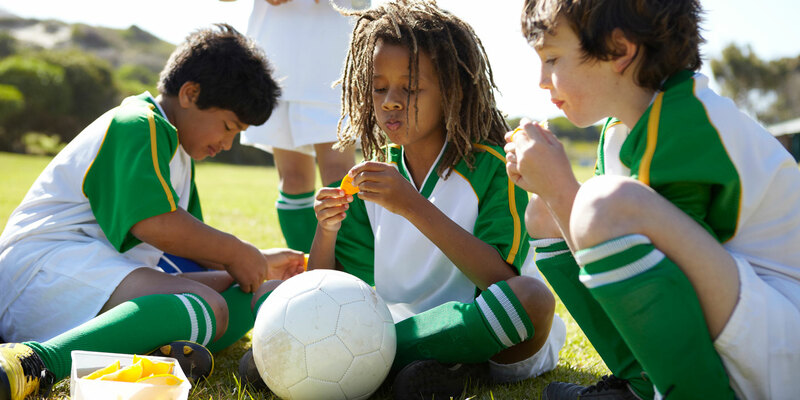 How do you make sure your soccer player is eating nutritious food, especially if they tend to be a picky eater? 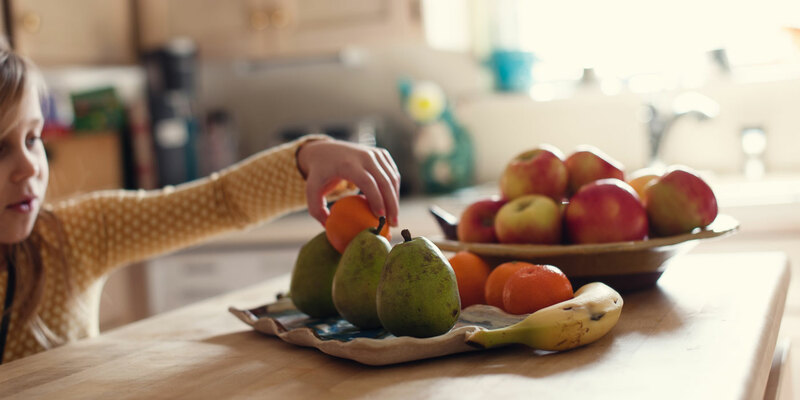 Mom, dietitian, and nutrition expert Abby Langer has great advice about how to help selective kids learn to like new foods. Feeding our kids is one of our most basic instincts, so when a parent feels as though their child isn’t getting the nutrition they need, it can be really distressing. I totally understand—as a parent myself, I’ve experienced it firsthand. I have plenty of friends and clients who are the parents of picky (or, as I’d rather call them, “selective”) eaters, and they’re always looking for new strategies to use with their kids. Here are my top tips on how to handle selective kids! Hiding things like vegetables in other dishes can create trust issues between you and your child, and doesn’t really teach kids how to enjoy a variety of foods and the taste of whatever you’re hiding (usually, it’s vegetables). Instead, model healthy eating behavior for your kids by sitting at the table when you eat, and by choosing and eating a wide variety of foods. Kids do as we do, so the best thing we can do is set a good example for them with our own eating. Also: please don’t force your kid to eat any food they don’t want to, or to sit at the table until they finish their meal. This can create a negative association with food and eating that can follow them long into adulthood. I always tell parents: if you make it a big deal, it’s going to become a big deal. Kids pick up on your cues, so hovering over them while they’re eating and making remarks about what they did or didn’t consume is probably going to backfire on you. Instead, try not to comment on what your kid has or hasn’t eaten. If they didn’t eat something on their plate, just take the plate away without reacting, and try again at the next meal. Once the pressure is off, you may find that your child is more open to trying different foods. I personally prefer the term “selective eater” instead of “picky eater,” but labeling someone can turn into a self-fulfilling prophecy. It can take up to twenty tries for a selective child to accept a new food, so give them a chance to make up their mind about which foods they really like and don’t like. Every child is different in terms of tolerance and speed at which they accept new things, and that’s okay. If you know your kid will eat carrots but hasn’t tried broccoli, serve them side-by-side. If they reject the broccoli, at least you know that they’re likely to eat the carrots. Plus, they’re being exposed to the broccoli, which means they might try it in the future as it becomes more familiar to them. To get kids used to new foods, try preparing them in different ways. For example, if your kids love fried french fries, try making fries in the oven. If they accept oven fries, then try roasted baby potatoes. If they accept roasted baby potatoes, then try baked potatoes. “Chaining” foods through different cooking methods is a way to help kids open themselves to new foods. If kids aren’t ever hungry, they’ll be less likely to try new things. Giving kids snacks constantly can really affect hunger levels. In addition to this, beverages such as juice and milk in excessive amounts (more than 1/2 cup a day for juice, more than 2 cups a day for milk, depending on the child’s age) can also fill little tummies and make them less ready to accept new foods. Try to feed your kids on a schedule so they can feel hungry before meals. Give kids healthy snacks that contain protein, fiber, or both—snacks like roasted chickpeas, CLIF Kid Zbars, cheese and crackers, fruit with nut butter, and hummus with vegetables. These will satisfy them without resorting to nutritionally-void junk food. I see a lot of parents resorting to giving junk food because otherwise, “he just wouldn’t eat anything.” What’s happening though is that by doing this, you’re teaching your child that holding out long enough eventually gets them what they really want: cookies and other junk, instead of a meal. Young kids generally don’t starve themselves; they’ll eat when they’re hungry. If kids aren’t hungry, they’re not going to eat. If your child doesn’t want to eat what you prepared for the meal, don’t force them. Some parents will pour their child a bowl of cereal or make them a peanut butter sandwich, but giving junk food or cooking another entire meal for them is not the best approach. Getting kids invested in what they’re eating isn’t too hard in most situations. Bring your child to the grocery store and let them choose a new food to try—a fruit, vegetable, meat, fish, or legume. Then let your child (depending on age) find a recipe that uses the food they chose, and help them prepare it. Chances are, they’ll be more open to eating something they put the effort into making. If you still have issues, please consult your pediatrician and a registered dietitian for individualized help. 1. 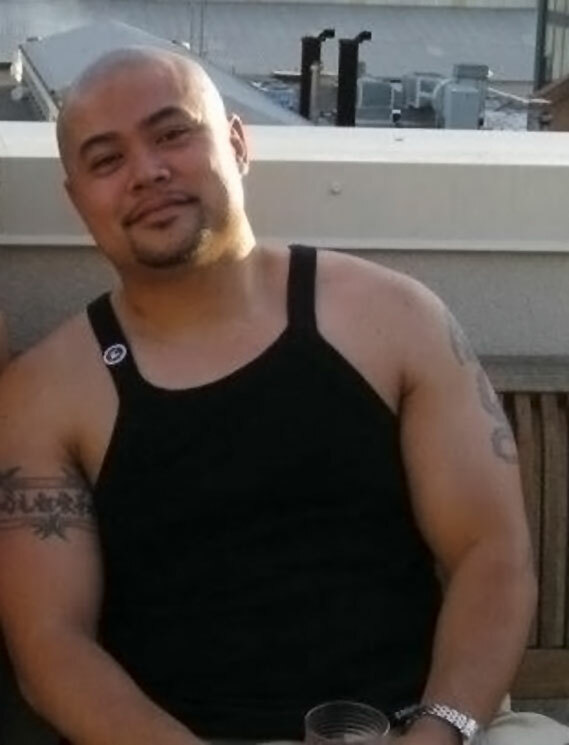 Cliff, before he worked at Clif Bar. 2. Ready for Kona, 6 years later. “I was like, ‘Oh my gosh. I can run three miles! I wonder if I can run more? !’” Cliff said. Feeling inspired, he signed up for a half marathon that was three months out. Then he went to Clif Bar & Company’s employee gym and asked for help. He began training with other runners at work—Clif employees are encouraged to take a 30-minute wellness break every day—so finding running partners wasn’t difficult. Neither was finding a personal trainer, since the company employs four trainers full-time at the in-house gym. Before he knew it, Cliff was buying himself a bike, his first-ever geared bike. (The last bike he had owned was a BMX when he was a kid.) Pretty soon his personal trainer, Joe Phillips, had him out riding 5 miles, then 10, then 30. Around that time, Clif Bar sent out an all-company announcement celebrating an employee from the finance department who had just competed in IRONMAN Coeur d’Alene. One year later, though, he was learning how to swim—thanks to Joe, his personal trainer at work. He did his first triathlon “for fun” in 2013. He met a lot of people and made some friends. A few of them were planning to compete in 2014 IRONMAN Canada. They asked Cliff to join them. He said yes. And so a triathlete was born. In 2016, Caroline, an electrical engineer at Abbott Labs, competed in her first triathlon—and then her first half IRONMAN in 2017. Pretty soon, the kids joined in as well. All three of them: Crimson (9), Cyrus (7), Cali (5). In fact, Cliff wasn’t the only one who competed at Kona this year. 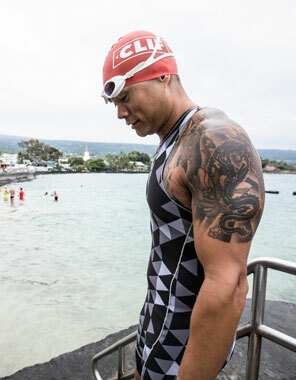 His children did the IRONKIDS Keiki Dip ‘N Dash—a one-mile run and 150-yard swim in open water. But all along the way, as Cliff began competing more and more, IRONMAN Kona was out there, a fantasy. Then earlier this year, it became real. In the weeks leading up to Kona, Cliff was in full training mode—and found himself bombarded by support from all sides. 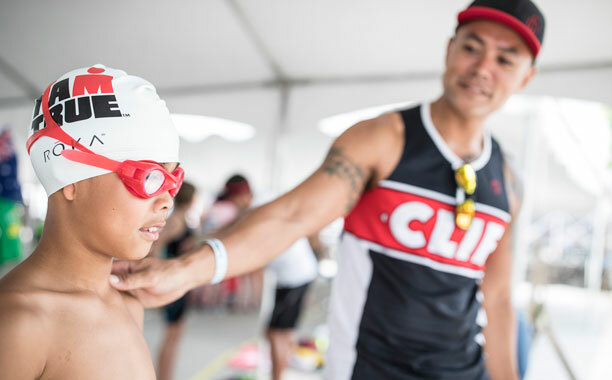 “At Clif Bar, the support system is amazing. It’s almost like the company is carrying me along on this ride,” he said. “A lot of other triathletes who work here offer their advice and let me train with them. They’re constantly checking in, making sure I’m on it, making sure I’m not just training hard but resting hard, too. 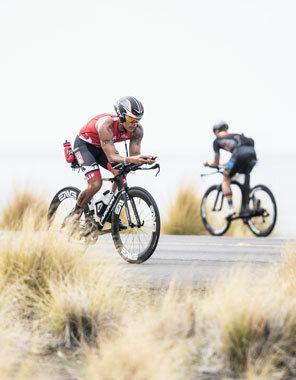 “My department, my boss, my team, my colleagues—when they found out I was doing Kona, they were in full support, ‘Let’s make sure you have the time and flexibility to get your training in.’ …And having access to personal trainers here just opens up everything, it’s really changed me into an endurance athlete!” Cliff said. He also consulted with a Clif Bar nutritionist who helped him create a nutrition plan with a schedule of eating and drinking for training days and race days. And of course, he counts on Clif Bar products day in and day out. Peanut Toffee Buzz and Peanut Butter Banana with Dark Chocolate are his go-to bars. His top SHOT gels are Citrus and Razz, and Salted Watermelon are his favorite BLOKS. But beyond all the support Cliff gets at work, the support of his family is indispensable. His mom is so proud, she calls him her “Iron Son” and shares his competition photos and videos with all her friends. The couple shares a calendar, and Caroline plots out all Cliff’s training sessions on it, along with the kids’ swimming, dance and gymnastics commitments. Heading into the Kona competition in October, Cliff had two goals. First, to finish. “You only get the medal if you finish,” he said. Second, to beat the time of Kevin Cleary, Clif Bar & Company’s CEO. Kevin competed in IRONMAN Kona in 2016 and finished in 13 hours. 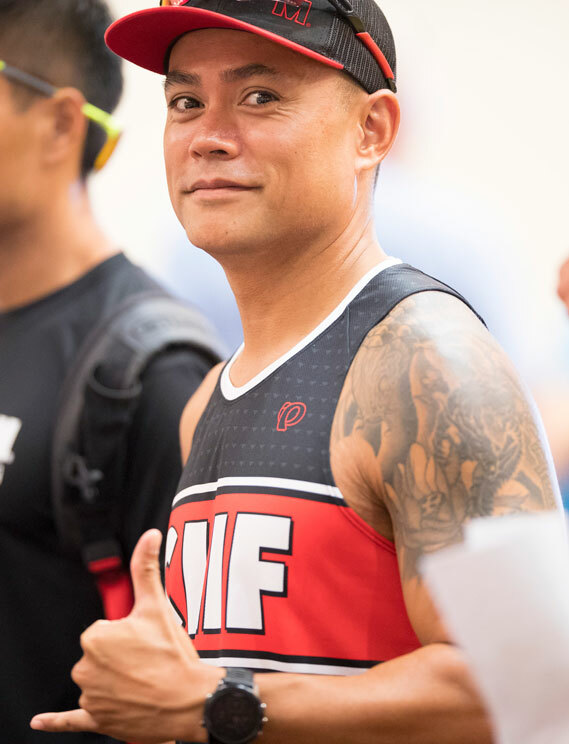 When he arrived in Hawaii five days before the race, the nerves hit Cliff pretty hard. He saw the professional athletes getting off the plane and watched them train and began to wonder what he was doing there. Cliff headed out on his bike for a couple of training rides and found the course harder—and hotter—than he expected. Mentally, it started to get to him. But then something special happened. Everywhere he went, he ran into someone from Clif Bar. And everyone he bumped into had something good to say. “They greeted me, they cheered me on, they made me feel like I did belong there, I did earn the spot, I should be competing,” he said. Knowing my kids were nervous helped calm me down, somehow. I knew they could do it, just like everyone else knew I could do it. And then there were his kids. 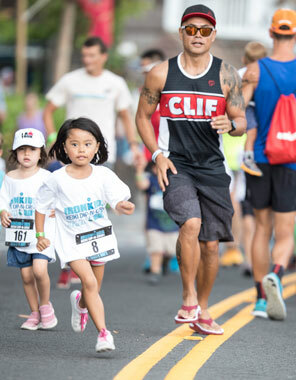 Crimson, Cyrus, and Cali were so nervous about competing in the IRONKIDS race—to them, it was just as big of a race as Kona was to their Dad. Cliff had to inspire them and remind them that they swim and run those distances all the time at home. 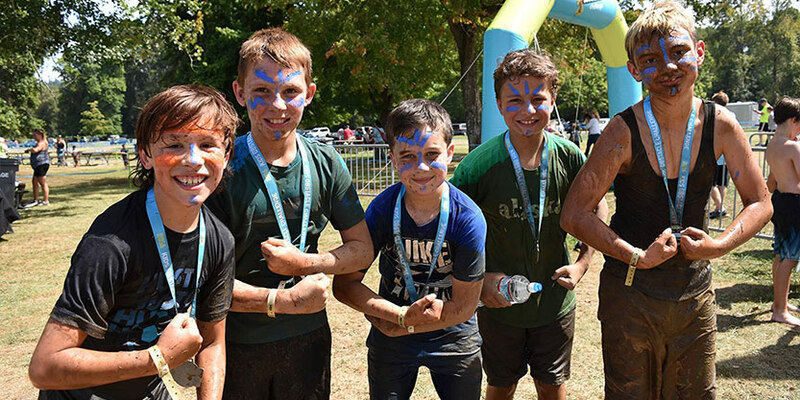 “Knowing my kids were nervous helped calm me down, somehow,” Clif said. “I knew they could do it, just like everyone else knew I could do it. “And they did great! I ran with my daughter, she wanted me to run with her, but at the turn-around point she said, ‘Bye, Daddy!’ and she just took off. She dusted me! I couldn’t keep up with her,” Cliff laughed. It was 98° with 90% humidity on race day. But waiting at the starting line, Cliff said he felt more comfortable than ever before at the start of a race. “I was just soaking up all the support from everyone, from all these elite athletes around me, from Clif people, from my family. It was an incredible experience,” Cliff recalled. In the end, he met his goal…both of them. Cliff finished IRONMAN Kona with a time of 12:52, eight minutes under plan. And Kevin Cleary was there to see it. Clif employees formed a tunnel for Cliff to run through, just before the red carpet at the end. “Of all the people that raced Kona that day, I probably had the best cheering squad. Because Clif Bar was there and everyone was so supportive,” Cliff said. Would he do Kona again? Well, yes and no.